This book is a collection of essays on occupational therapy theory and its application in practice. They represent the reflections, on aspects of occupational therapy, of experts in their own fields who are at the cutting edge of theory development. At the beginning of the twenty-first century, occupational therapists are beginning to conceptualise occupational therapy as a complex intervention. This book provides the level of detail to support such an understanding. Two chapters discuss the profession of occupational therapy: how it has developed and what is involved in being an occupational therapist. 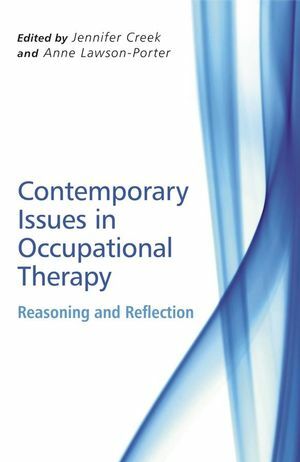 Other chapters explore the idea of occupation from different perspectives, providing detailed analyses of the concept that is central to the profession of occupational therapy. The third type of chapter describes how theory is used in occupational therapy practice, for example, in making decisions or implementing research findings. Jennifer Creek has been an occupational therapist since 1970, when she qualified from the London School of Occupational Therapy. She has worked in the fi elds of adult mental health, adult learning disabilities, mental health promotion and occupational therapy education. She is the editor of a textbook Occupational Therapy and Mental Health, which is about to go into its fourth edition. This is her second edited collection of essays. She is currently working with the European Network of Occupational Therapists in Higher Education terminology project group to produce a conceptual framework for occupational therapy in Europe. Anne Lawson-Porter qualifi ed as an occupational therapist in 1974 and worked in the fi eld of physical dysfunction for the fi rst ten years of her career in both health and social care settings. Her next move was into occupational therapy education; she has taught occupational therapists at both undergraduate and post-graduate levels. Her passion for occupational therapy was renewed in the move to her current post as Head of Education for the College of Occupational Therapists where she continues to work hard to infl uence and develop learning opportunities for all members of the profession. Introduction (Jennifer Creek and Anne Lawson-Porter). 1. The thinking therapist (Jennifer Creek). 2. The romance of occupational therapy (Clare Hocking). 3. Occupation for occupational therapists: how far will we go? (Clare Hocking and Ellen Nicholson). 4. A psychoanalytic discourse in occupational therapy (Lindsey Nicholls). 5. What’s going on? Finding an explanation for what we do (Rosemary Caulton and Rayna Dickson). 6. When service users’ views vary from those of their carers (Elizabeth White). 7. Engaging the reluctant client (Jennifer Creek). 8. Exploring the facets of clinical reasoning (Kit Sinclair). 9. Knowing more than we can say (Priscilla Harries). 10. Making sense of research utilisation (Katrina Bannigan).